The Endura FS260 Pro SL bib shorts have been the best on test in both our Cycling Active and Cycling Weekly grouptests. Here is our review based on long term use. A comfortable pair of bib shorts is an essential piece of kit. In creating the Endura FS260 Pro SL bib shorts, the Scottish clothing company has realised that the current ergonomics applied to bib shorts does not suit everyone. For example, just because you are 6’4″ and 100kg, does not necessarily mean that you have really wide sit bones. To put it another way, an XL pair of shorts is likely to have a huge chamois, regardless of whether the wearer needs it or not. Conversely a small rider can have wide sit bones and require small shorts with a wide chamois. Endura has teamed up with bike shops to offer their gebioMized®-Endura Pad Fit™ System. 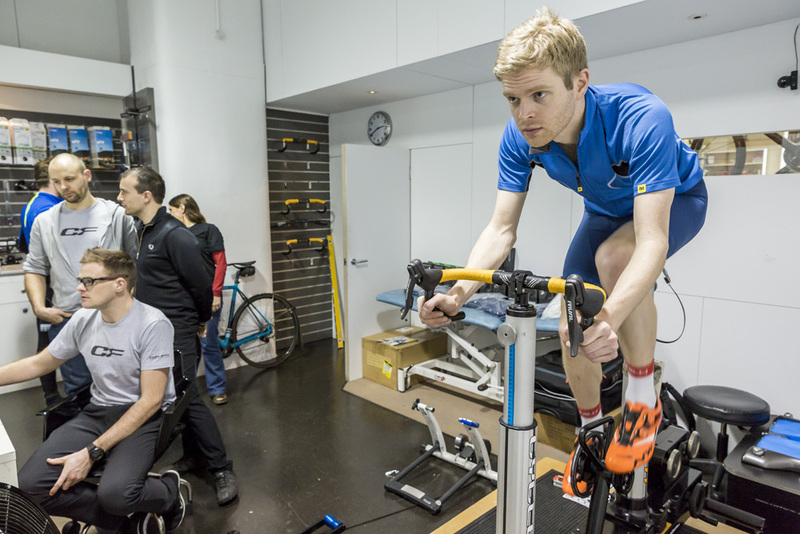 The first shop to partner with Endura was Cyclefit, so I headed down to see for myself. The system is designed to quickly match a rider to the correct seat pad, based on their physiology, riding style and saddle. I took my existing saddle along, but you could also take your complete bike into the shop. The fitters attached I saddle to a jig, where upon that placed a sensor mat over the saddle. Endura then provides a pair of test shorts with no chamois. The jig can be set up to your exact bike measurements, or alternatively you can just use your complete bike and a turbo trainer. This is important, as it means you replicate and assess your normal riding position. You are then instructed to pedal on the hoods, tops and drops at your normal cadence. The sensor mat detects where the pressure is being applied on the saddle and identifies hot spots. The software analyses the results and matches to the pad width that will offer optimum performance and comfort. There are three different sized pads, with my test suggesting a size small (green). I then repeated the test sitting in a different part of the saddle, validating the original result. The shorts are available in two different leg lengths too, should you wish to opt for the Bradley Wiggins-style long leg (a design which could potentially offer some aerodynamic benefits). My recommended shorts were a size medium, regular leg with a narrow pad (green). The next step was to try on my new Endure FS260 bib shorts and ride them to see how that affected my pressure mapping. Endure describe the shorts as ‘love at first sit’. And I would agree with this! They just felt right as soon as I started pedalling in them. Although the pad fitting system is available in some shops, it is by no means necessary. The bib straps work very well and don’t dig in and wide grippers are very comfortable too. After long term use and many washes, the shorts stood up well too. Owing to heavy use there are signs of wear, but compared to other premium shorts the durability just as good and in many cases, better. For more information, head over to Endura.